I just love making chutneys of all kinds, so much so that I’ve recently added “chutneys” as a category in my recipe drop-down here on my site. They are healthy, delicious and perfect to give to friends and family during the holidays. Instead of the usual bottle of wine next time you drop in on folks, offer a jar of chutney. Sometimes, I include a recipe to pair with the chutney and explain that chutney is kind of a savory jam that generally goes well with grilled meats or roasted poultry. I made my first batch of this Christmas cranberry chutney just before Thanksgiving, and we sampled it with our turkey dinner. The tart flavor of fresh cranberries is both softened and sweetened by the addition of dried fruits – and you can play with your favorites here, just keeping the proportions of dried versus fresh fruit the same. The jars are pretty, festive and I plan to serve some both with our Christmas beef and New Year’s Day pork. Because the cranberries don’t release as much juice as some other fruits I use in chutneys, such as mangos and rhubarb, I increased the amount of orange juice in my recipe. I was happy to make a chutney that reduced the amount of tedious chopping frequently involved in the prep. No need to chop either the fresh cranberries or most of the dried fruit, except for the apricots. TIP: If you don’t wish to can your chutney, it can be kept in the fridge for several weeks. For a review of safe canning procedures, here’s my favorite link. 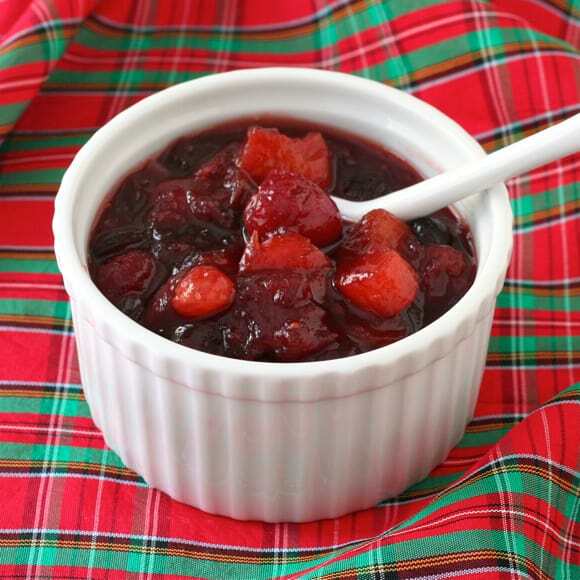 A fresh, festive cranberry chutney, nice for holiday gifting or feasting. Using a large, heavy-bottomed pot such as a Dutch oven, combine the sugar and vinegar. Bring to a boil over medium heat, stirring occasionally. Add all remaining ingredients. Stir to mix well, bring chutney to a boil, then reduce heat to low. Cook, uncovered, over low heat for 2 hours, stirring every 10-15 minutes or so. Ladle into sterile jars and cook jars in a water bath for 10 minutes, according to safe canning procedures. Oh Liz, this looks fabulous! I have a chutney that I sell this time of the year that has cranberries, ginger and fresh pears and it is lovely. I really like your combination especially adding the apricots! Thank you, Wendy – you are the master! So funny – maybe we should do a homemade gifts round-up! The flavors in this look fantastic Liz! Good idea – thanks, Beth – enjoy the season. Very festive! What a lovely addition to the Christmas table this would make! Thanks, Jayne – it will be on our table with the Christmas beef and spinach gratin. Thanks, Carol – it is my new favorite chutney. This looks wonderful Liz! I love the vibrant color and all the contrasting flavors in the recipe. I’ve always limited cranberry to the Thanksgiving menu, but enjoy it so much that would love to make it part of the Christmas meal. I love cranberries and stock my freezer this time of year – great with pork, chicken – sauce or this chutney – or a marinade. Love the ruby red color of this gem of a dish! I love cranberry chutneys and this one looks amazing! I did one this year with merlot and blueberries and it turned out so good. I love that yours has everything from Grand’Ma to onion to ginger in it! Merlot sounds like a great addition to any chutney – thanks, Averie.